Anvil For Sale... Ya RIGHT ! - The Iron Forge Fire Blackmithing Forum. I'm not sure where this should be posted, I looked at the Threads, Forums, and thought it fit here under Tools; please feel free to move it if I screwed up ! I had to post this... I found it on eBay... give me a break ! I was looking on eBay this AM, searched "Blacksmith" so I expected to get anything and everything with the word "Blacksmith" and I did ! The post is for "1800s Antique Anvil From Blacksmith Farm Shop In Mississippi"; quoted from eBay ad ! Asking Price: $500.00, plus $125.00 for shipping ! The Seller states: "Very Old Anvil", I would say very beaten up Anvil, how old it is, I do not know but it has seen some major pounding / abuse ! I don't usually post on what is for sale or what is the asking price BUT this one got to me ! Cast iron that lost the face plate and kept on working the poor thing. Looks like a 100 year old man with no denture. Old ... as if age was a virtue for an anvil, like wine or violins. As if ... then again ... if it ends up like my very first anvil, sitting proudly on a book shelf in my architect brother living room ... that sad anvil may retire in style. Funny, the old man thing, and yes I expect this little old anvil to end up in a garden or next to a barn door, just for show. 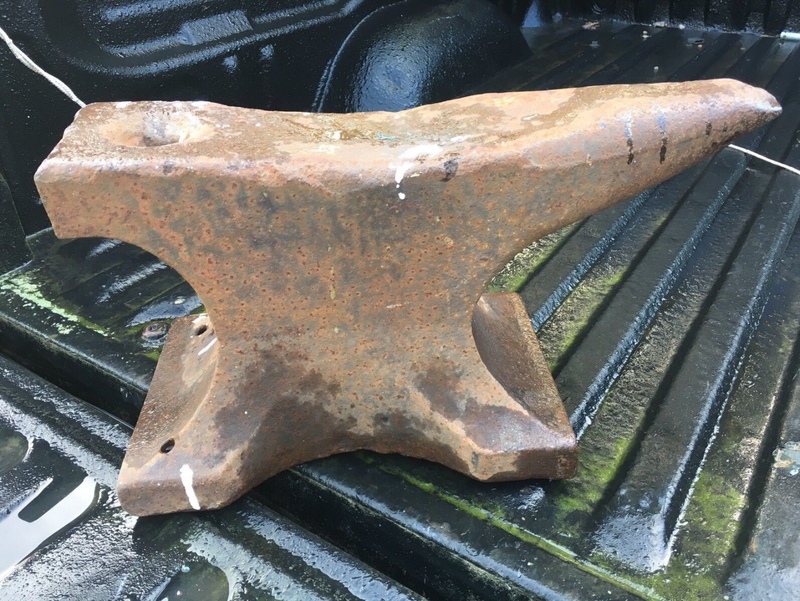 It just got me in the advertisement, "1800s Antique Anvil From Blacksmith Farm Shop In Mississippi"; quoted from eBay ad ! Advertising, it is all in how you say something, and if there is someone out there that thinks it is what they want... then they will buy it for $500.00 + Shipping ! Thanks for the reply, funny how people think ! From the shape of the horn, it seems to be just a modern day made in china anvil. I don't know enough about Anvils to even say that...! I don't know if I would even attempt to sell it, funny !